If you ride your road bike on a regular basis, you know the drill: Road traffic holds many dangers for cyclists. A careless car driver, stones and rocks on mountain pass roads, or unexpected wetness in a bend. As a cyclist, you fall quicker than you would expect. Road bike helmets can't prevent accidents but they will definitely reduce the damage. Therefore, you should always use a helmet, no matter if you're on a multi-day tour or on your way home from work. What makes for a perfect road bike helmet? All road bike helmets have one thing in common: Their certified protective function. Every helmet comes with the same protection level, no matter if you buy one for little money from a supermarket or a high-end professional model made of carbon. You only have to replace it after an accident. Road bike helmets differ in their material, design, and features. Depending on the intended use, road bike helmets come in different shapes. Classic helmets for touring are breathable, don't fit too tightly, and look like mountain bike helmets. Giro, POC, and Endura use light but robust materials, so you will hardly recognize them. 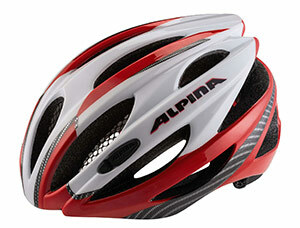 Ventilation slots provide permanent air circulation and prevent your head from overheating under the helmet. On longer tours, little weight and a good ventilation system are very useful features. 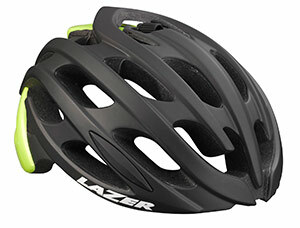 Helmets for triathlon and time trials from manufacturers like Lazer come in extraordinary designs. They hardly have any ventilation slots, which makes them perfectly aerodynamic and saves you the decisive tenth of a second. The quality of a touring helmet is also determined by its features. The padding on the inside of your helmet determines the shock absorption when you fall. Moreover, it also makes your road bike helmet comfortable to wear, which is important even if the athletic aspect is your top priority. Depending on the model, road bike helmets come with different safety features. Reflective elements raise the level of traffic safety during night rides significantly and don't affect your performance. Some road bike helmets come with additional mounting options for safety lights. Mosquito nets are another safety feature of road bike helmets. The probability of a bee or wasp flying into your helmet is relatively low but the possible consequences are all the more dangerous. There is a simple rule for any road bike helmet to unfold its full potential: It must fit. Many manufacturers offer individual models in different sizes, which provides you with an even greater range of fitting models. An adjustment mechanism, i.e. a rotary knob, allows you to make fine adjustments. The individual shape of every helmet varies from brand to brand and determines whether or not the helmet fits. Therefore: The proof of the pudding is in the eating! Or in other words, just try it on. Road bike helmets are often used in combination with cycling glasses. Therefore, you should make sure that both items are compatible and won't cause unpleasant pressure marks. If you often ride your bike at cold temperatures, you should think about wearing a bike cap under your helmet. Again, you should make sure that your road bike helmet fits comfortably despite the bike cap.